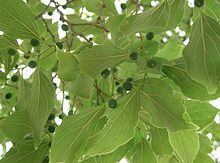 Celtis is a genus of about 60–70 species of deciduous trees. They are commonly called hackberries. They grow in temperate regions of the Northern Hemisphere, in southern Europe, southern and eastern Asia, south to central Africa, southern and central North America, and northern and central South America. This page was last changed on 16 December 2015, at 08:32.